Brenglora Bulldogs-English Bulldog Puppies For Sale. English Bulldog Puppy update! We will have puppies born June 2019. Taking reservations now. Call or text us for more information. 316-775-5921. One Of Our English Bulldog puppies. Welcome to Brenglora Bulldogs. Brenglora Bulldogs was established in 1979, making us one of the oldest established English Bulldog breeders in the U.S. Looking for an English Bulldog puppy for sale? We have top quality English Bulldog puppies for sale from the best world renowned champion bloodlines. Offering sales and delivery of our puppies nationwide. For those who want the very best. You can trust us for your next family member. Our website has been online since 1997. We sell healthy English Bulldogs and are Breeders of English Bulldogs living to 14. All English Bulldog Puppy Photos and videos on this website are puppies bred by Brenglora Bulldogs. We are not associated with any other breeders or resellers. All of our puppies are home raised by us from our dogs. If you are looking for a reputable breeder with top quality English Bulldog puppies for sale, give us a call to help you find your perfect puppy. Our puppies are very loved and well taken care of and we want this to continue when they go to their new homes. All of our Bulldogs are bred to standard from European champion bloodlines. Buyers can call us anytime for advice and guidance after you bring your puppy home. We offer Personal hand delivery by our courier to most U.S. airports. Buyers are also welcome to fly to our nearest airport we will meet you there and you can take your puppy back home with you as a carry-on. Brenglora Bulldogs is state inspected,veterinarian and American Kennel Club inspected. We are approved by all. We are top rated by our puppy buyers on Facebook as well. Quality is not cheap. Our puppies are no exception. If you are price shopping you may be looking at the wrong breeder. We have a lot of time, money and effort in our dogs and their care. We want only the best at Brenglora Bulldogs. Be aware a low priced Bulldog puppy may have high veterinary costs due to health problems. Bulldogs in general have always been considered expensive compared to other breeds due to high expense of c-section births and around the clock care of newborn puppies. Also newborn Bulldog puppies can have a high mortality rate. We sell all of our puppies as pets on spay/neuter agreements no exceptions. As reputable english Bulldog breeders, we are not about the latest fad for making more money. Fads are Mini Bulldogs, non standard colors and eye color not allowed in the Bulldog breed standard. Bulldogs were meant to be as described in the breed standard not to be non standard colors or sizes. Breeding to the breed standard and protecting the Bulldog breed is why we breed Bulldogs. Understanding and using pedigrees of the best Bulldogs available and knowing what those dogs contributed to their offspring is vital to producing the best English Bulldog puppies and avoiding health problems. Look for a Reputable Bulldog breeder. Carelessly bred English Bulldog puppies offered for sale are a dime a dozen and are most likely to have health or temperament issues. Do yourself a favor and purchase your English Bulldog puppy only from a qualified breeder not a backyard breeder or pet store. Look for Bulldog breeders that are Bulldog Club Of America members. These breeders are more likely to be reputable. Ask for proof of membership as we have seen some Bulldog breeders saying they are members and are not. We have been members since 1980. At Brenglora Bulldogs we take pride in producing top quality English Bulldog puppies for sale to families and individuals wanting a healthy, well bred English Bulldog puppy. We will have new litters born in 2019. Reservations being accepted now. Call us to get information for future puppy availability. Since we are not a mass producer or re-seller we do not have English Bulldog puppies for sale all of the time. The focus at Brenglora Bulldogs is more on quality and health not how many pups we can sell. Reserve your puppy from future litters to get the English Bulldog puppy you have your heart set on. With a reservation you can look at each litter until you find the puppy you fall in love with. We offer standard colors only seen in purebred Bulldogs. We usually have, Red, light fawn, or white. The fawn or darker red are usually combined with white markings. English Bulldog Puppies from the more reputable breeders are bred to standard, vet checked, and raised in a loving environment. When it comes time to sell the puppies, the breeder carefully screens potential adopters. At Brenglora Bulldogs we are Bulldog Enthusiasts and follow these practices when planning a litter and selling our puppies. We keep a waiting list for our puppies and want to assure they get the best homes. 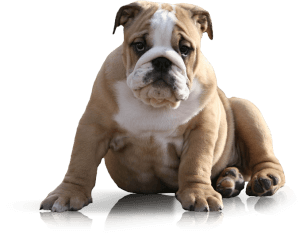 Our English Bulldogs are all our pets and are treated as family members.The English Bulldog breeder you choose will be the best or worst decision you can make when looking at an English Bulldog puppy for sale. Pick your breeder carefully and as a result, you will be assured of the healthiest English Bulldog puppy having the least amount of issues. When you purchase a puppy from Brenglora Bulldogs, you will have lifetime advice and guidance. Contact us to get on our future puppy waiting list or more information. Gloria Redden PH-316-775-5921 Our hours are 9am to 8 pm Monday through Saturday CST. All rights reserved. No part of this website can be copied or transmitted in any form without written permission.